If you’re already familiar with what SSS is you can safely skip this section. Subsurface scattering (or SSS) is a mechanism of light transport in which light penetrates the surface of a translucent object, is scattered by interacting with the material, and exits the surface at a different point. The light will generally penetrate the surface and be reflected a number of times at irregular angles inside the material, before passing back out of the material at an angle other than the angle it would have if it had been reflected directly off the surface. 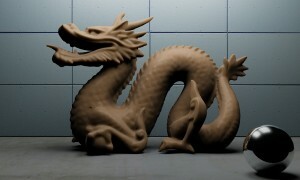 Subsurface scattering is important in 3D computer graphics, being necessary for the realistic rendering of materials such as marble, skin, and milk. 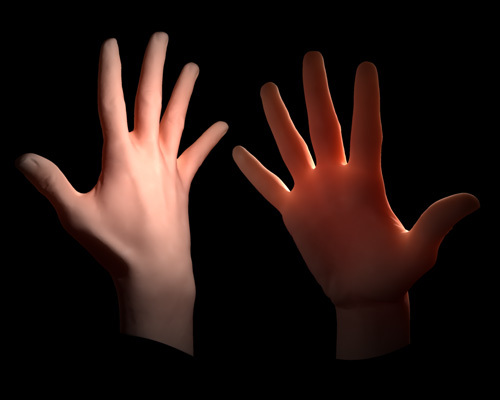 Sub-surface scattering is most visible at thin geometry like between fingers. You’ve probably seen this effect before- like when you hold a flashlight over your fingers or the sun shines through your eyelids. The light travels through your skin and gets scattered, taking on a reddish color. 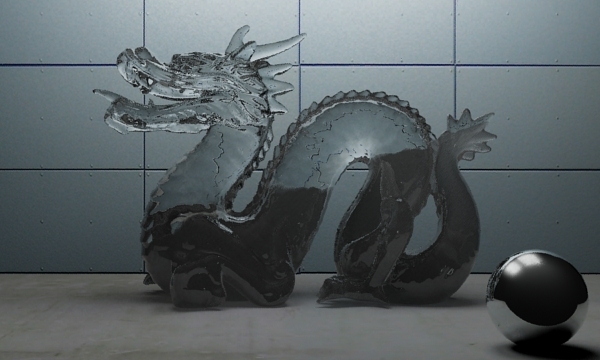 When enabled in a render it can have a subtle but dramatic impact on how your renders look. Direct light sources will shine light on your object and, when configured correctly, mental ray will be able to scatter and color that light the same way that light would behave in real life. Consider the images below. Stanford dragon with sub-surface scattering enabled. Stanford dragon without Sub-Surface Scattering but similar glossiness and specularity. For the purposes of this tutorial, we’ll be considering the SSS Fast Skin Material and the SSS Fast Skin Material + Displace as virtually identical. They’re only differentiated by the ability to add a displacement map. Examples of each are shown below at default settings appropriate for the scene size. We’ll go over material settings later in this tutorial. Let’s begin with the simplest SSS material- the SSS Fast Material. I’ll use a gradient ramp, a rainbow map, and a single render to demonstrate the effect of various parameters. Note that I won’t render all of them because many of these parameters have to be pretty extreme in order to change the render. Besides, 99.9% of the time you won’t have to alter parameters like Lightmap size or Falloff strength. Parameters that take color maps- like unscattered color- will be tested using the “rainbow map” you see along the bottom of the image below. Parameters that take numerical maps- like front-surface scatter weight- will be tested using the “black-to-white” gradient ramp above the rainbow map. Wherever I state values below an image, it’s referring to the gradient ramp and is read from left to right. I.E. “Values are 0.0 to 1.0″ means that the left side of the image is 0.0 and the right side of the image is 1.0. This is the original render with the gradient ramps along the bottom. Below are definitions for each parameter in the SSS Fast Material rollout. The SSS Fast Material (mi) Parameters give you high-level control over the quality of the SSS effect. All objects that should scatter light into each other should be in the same scatter group. To conserve memory, use as few scatter groups as possible. A person’s hands, face, etc. can use the same scatter group; even hands and faces of different people. In general, different scatter groups should be used only when using the same group would cause visible problems due to objects incorrectly scattering into each other. Two characters shaking hands, for instance, would need to have their hands in different scatter groups. Lightmap size is the size of the lightmap as a percent of the total render size. The lightmap is based on screen space and 50% or less is usually enough (and it’s the default), but if edge artifacts start to appear, you can increase this value. You’ll rarely need to alter this value and it’s tough to get a change in your render while altering this parameter. Number of samples sets how many samples from the lightmap are used (maximum) per rendered ray. Ideally this should be a power of two. 32 is probably the lowest useful value and 128 is plenty of resolution. However, if the scattering radii are really large then you may need to increase the samples in order to avoid any noisy artifacts. 10 samples on the left and 128 samples on the right. This should already be familiar to you. You can apply a bump map to your material in order to add detail to your material. One important thing to note is that bump mapping does not affect how your sub-surface scattering is calculated. It only affects the color and specularity of the material. You should already know what bump mapping would do to this model so I think we’re good without a render. This parameter group is responsible for controlling the color and spread of light through the material. The ambient light controls is the ambient component as though it were an ordinary Standard material. This light will also be included in the lightmap and get scattered like any other light source which makes it the perfect place to add any HDRI light. Here’re some good HDRI maps you could use. An ambient light example using the rainbow map. Notice the purple color on the belly. All diffuse colors below are multiplied with this global color to yield the final result. 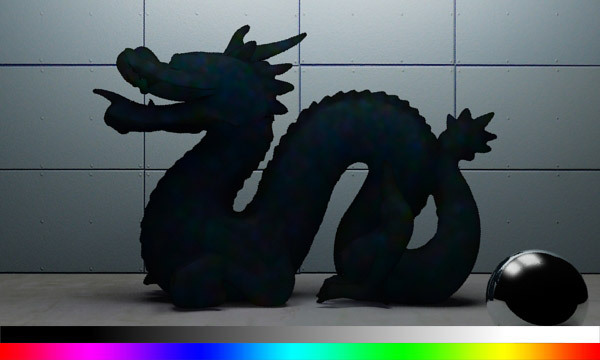 This parameter is useful for coloring the final color of the material or to apply maps that change all light that hits the material. Moles on a character’s skin, for example, will block almost all underlying light (even scattered) and would make sense applied here. This image has the rainbow map in the overall diffuse coloration map slot. This is pretty straightforward. Adding color to this map will only affect unscattered light and will color the model but less-so than overall diffuse coloration. Compare the image above with the one below. The unscattered diffuse coloration using the rainbow map. 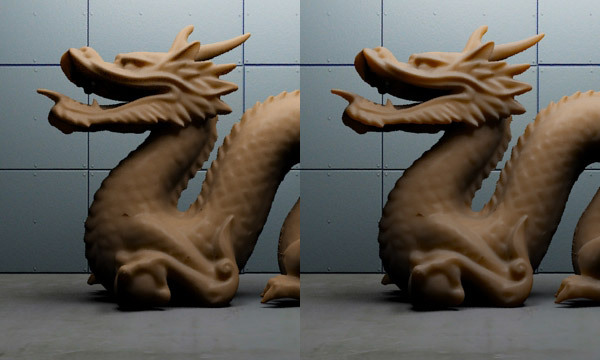 The weight control handles how significant the unscattered diffuse color should be in the final material. In the image below, the low weights on the left reveal a material almost exclusively made up of sub-surface scattering. On the right the material has a high weight and is mostly the “white” color we used in the diffuse color swatch. The unscattered diffuse weight parameter controlled by a gradient ramp. Values are 0.0 to 1.0. These control the color and weight for the front surface scattering. 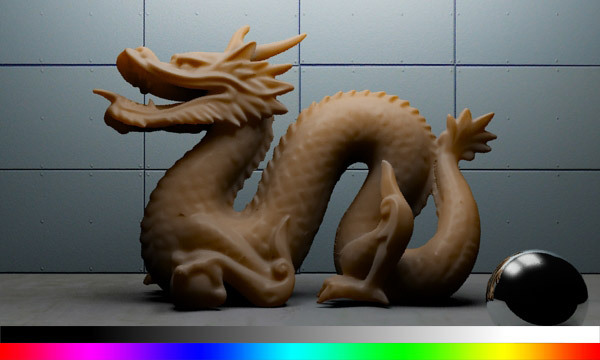 Front-surface scattering affects surfaces that are facing the light source and are directly illuminated. Other than that, the controls are very similar to the ones we used on the unscattered component above. 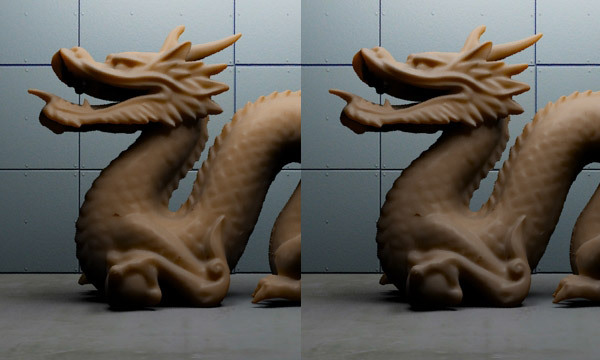 Notice that when the weight parameter is very low (left side of the lower image), the material becomes almost an ordinary Standard material except for the back-scattering component. Front-surface scatter color controlled by the rainbow map. Front-surface scatter weight controlled by a gradient ramp. Values are 0 to 1.0. The scatter radius controls how deeply the light should be scattered along the surface for light-facing areas of your material. This value is in scene units so if you’re working in feet like the downloadable example then .5′ means 6 inches of spread. Remember that this will get multiplied by the scale conversion factor discussed in the advanced parameters section. Front-surface scatter radius controlled by a gradient ramp. Values are 0.0 to 2.0'. These are the color and weight for the back-surface scattering. 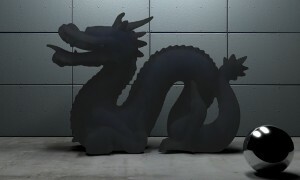 Back-surface scattering affects surfaces that aren’t facing the light source but are being indirectly illuminated through the surface of the object. Back-surface scatter color controlled by the rainbow map. Back-surface scatter weight controlled by a gradient ramp. Values are 0 to 2.0'. These are the scatter radius and depth for light that reaches the back surface from an illuminated front surface. Normally, the radius and depth are set to the same value (and if the depth is not specified, it defaults to the radius). I’ll include an extra render below. Note that it’s difficult to get this parameter to invoke a change in the render- the default is 0.03′ and these renders go to 1 foot. If you’re setting radius/depth to really high values you should consider changing the scale conversion factor instead! Back-surface scatter radius controlled by a gradient ramp. Values are 0 to 1.0'. Back-surface scatter depth controlled by a gradient ramp. Values are 0 to 1.0'. Back-surface scatter radius and depth controlled by a single gradient ramp. Values are 0 to 1.0'. The color and shininess control a regular Phong shader for the material specularity. This should be pretty familiar to you from working with Standard materials. The higher the shininess parameter, the higher the glossiness of your final material. The specular color generally doesn’t need to be edited but there are some cases when it can be useful. 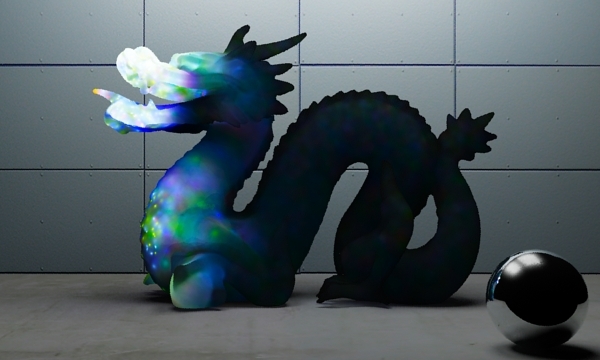 Specular color controlled by the rainbow map. Specular level turned down to 10 from the default of 33. The lightmap gamma curve is the gamma of the lightmap. If this is 1.0, normal diffuse light is stored. If it is less than 1.0, the curve is ‘flattened’ causing the light to spread out towards areas not directly facing the incoming light. If it is higher than 1.0, the curve is ‘narrowed’ causing the light to concentrate in areas directly facing the light source. In most cases, a value between 0.4 and 0.8 is fine. If this checkbox is checked then the material includes any indirect lighting (photons, final gathering, etc) in the lightmap to be scattered. This takes additional render time and one should judge on a case-by-case basis if the indirect light is significant enough that seeing it scattered or not makes a big difference to justify the extra rendering time. You also must turn this on in order to have your SSS material react to HDRI lighting via Final Gather or to caustics being cast by other objects. The scale conversion factor is the first place you should go when creating a new material. It’s a simple multiplier for all distances in the material. Scattering is distance dependent so loading a material designed for a model made in inches will not work on a model where the unit is meters, and vice versa. Scale conversion factor controlled by a gradient ramp. Values are 1.0 to 0. If this is set to 0.0 the scattering is completely uniform. Positive values favor forward scattering, and negative values favor back scattering. Backscattering is where light begins traveling through a surface but then turns around and bounces back the way it came.The allowed range is -1.0 to 1.0, but the useful range is much smaller. A value of 0.1 (a slight bias toward forward scattering) is a good start. Scatter bias on the left image is unchanged, and on the right is -0.50. This biases light backwards. This parameter sets the shape of the distance falloff along the scatter radius. Higher values will give you a more sudden falloff and lower values give a less sudden falloff. Lower values will also make the scatter distance look shorter, so you might want to compensate by increasing the actual scatter distance for a ‘softer’ look. For high values (1.0 to 10.0), almost all of the samples in the scatter radius are equally weighted. For low values (0.1 to 1.0), the samples near the edge of the scatter radius are weighted less. Falloff strength controlled by a gradient ramp. Values are 0 to 1.0. When this is turned on the system will choose a softer compositing of the sub-surface scattering layers. This must be turned off for photometric lights & photographic exposure control to look correct! That was intense. Now that we have a good hold on the basics of sub-surface scattering, let’s take a deeper look at the other material types and what makes them unique and useful. The SSS Fast Skin Material is very similar to the SSS Fast Material that we just learned about. This is because the SSS Fast Skin Material is like two materials layered on top of each other. The displacement map in the SSS Fast Skin Material + Displace is a simple 3d Displacement shader. There isn’t much information about what this shader does so I’ve written a quick post about the 3d displacement shader here. For the sake of keeping this tutorial as short as possible we’re going to look at the SSS Fast Skin Material + Displace because it’s a more functional version of the original Fast Skin Material. SSS Fast Skin Material unaltered render (20% conversion factor). The first major difference between the SSS Fast Skin Material and the SSS Fast Material is the extra front-surface scatter layer. If you remember from earlier, the front-surface scattering has to do with light-facing surfaces and how light spreads across that surface rather than through it. The reason for this extra layer is because skin and flesh diffuse light in a unique way compared to more homogeneous materials like stone or milk. Let’s have a look at what each of these layers looks like independently (without changing the defaults). Good values for the epidermal layer are a slightly yellowish color, a weight of 0.5, and a radius of around 0.2 to 0.4 inches. Notice what a huge impact the epidermal layer has on the overall coloration of this material! It’s pervasive but the default scatter depth is so low that much of the detail in the dragon’s scales is still there. This is the SSS Fast Skin Material epidermal layer isolated from the other layers. The subdermal layer operates in pretty much the same way as the epidermal layer (and the original SSS Fast Material). This tends to be a deeper, reddish scattering effect. A reddish/orangeish color with a weight of around 0.5 and a radius of 0.4 to 1.0 inches would be a good place to start experimenting. Remember that if you’re setting the scatter radius unusually high or low, you may need to adjust your scale conversion factor! Notice in this render how much detail we’ve lost due to this component’s high scatter radius. This is probably one of the biggest color components in the material. This is the SSS Fast Skin Material sub-dermal layer isolated from the other layers. As with the SSS Fast Material, this scattering represents light going entirely through the material. You can set this scattering as deep as you need, but generally light doesn’t go through flesh very far. In the image below you can see that the back-surface scattering isn’t a very heavy part of this example. We could increase the weight manually in order to get more scattering in the dragon’s tail and claws. The skin specularity functions are two-layered, allowing simulation of both the broad soft specularity of skin and any near-reflective specularities of top layer oiliness and wetness. Notice that this layer is inherently blue-ish and is less glossy than the secondary specular layer. This is the SSS Fast Skin Material primary specular layer isolated from the other layers. For skin, a good start is to have the primary specular layer with a very low shinyness (3.0 to 8.0) and a low level (0.1 to 0.3) and a slightly blueish color. Then the secondary layer should have a high shinyness (20 to 100) and a medium level (0.3 to 0.6). Introducing mapping into the specularity channels can significantly enhance realism, too! 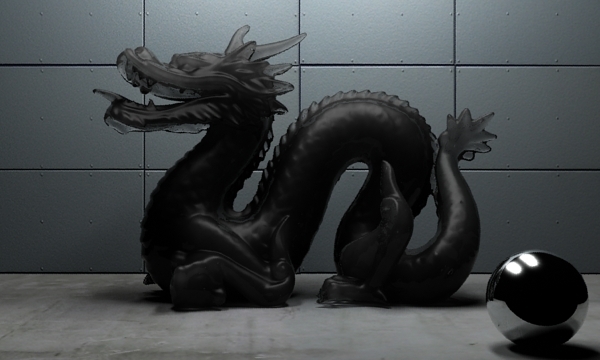 This is the SSS Fast Skin Material secondary specular layer isolated from the other layers. Whenever possible you’ll want to use the SSS Fast Material, yielding to SSS Fast Skin Material whenever you’re working on actual skin. These materials are highly optimized for working with day-to-day needs like candle wax, soap, or stone. In part 2 of this sub-surface scattering tutorial we’ll take a look at the SSS Physical material and shader, followed by how you can use Parti-volume to create more specialized effects. You’ll want to advance to those materials for highly refined renders like close-up products or more scientific renders or visualizations. materials into which light does not penetrate deeply. experienced users to set up scenes for global illumination. You’ll want to use the physical shader for highly refined renders like close-up products or more scientific renders and visualizations. Otherwise the fast shader family has everything that you need. Also I wanted to include a disclaimer for the images in this section. The SSS Physical Material requires a lot of calibration in order to look good. However this runs contrary to what I’m trying to do in this tutorial; to provide you with images that demonstrate only one change in a material with otherwise default settings. That’s why some of these renders might be kind of ugly. Now that the warnings are out of the way, let’s dig into the SSS Physical Material and get comfortable with the controls. In order for the SSS Physical Material to work properly, you must enable caustics generation. Don’t forget to enable “All objects generate & receive caustics” if you don’t want to set up a more complex solution. We’ll begin by going over the SSS Physical material parameters and how they impact the material during renders. One thing to notice is that the SSS Physical material and the SSS Physical shader have the same parameter set. This is because they’re basically the same thing. The SSS Physical material is actually just a mental ray material that has the SSS Physical shader assigned to the “surface” and “photon” slots. Since this is the case, we’ll only look at the material and I’ll leave exploring the shader component to you as homework. See the image below. The SSS Physical Material is identical to a mental ray material with instanced SSS Physical shaders in the Surface and Photon slots. As with before, parameters that take color maps- like unscattered color- will be tested using the “rainbow map” you see along the bottom of the image below. Parameters that take numerical maps- like front-surface scatter weight- will be tested using the “black-to-white” gradient ramp above the rainbow map. Wherever I state values below an image, it’s referring to the gradient ramp and is read from left to right. I.E. “Values are 0.0 to 1.0″ means that the left side of the dragon is 0.0 and the right side of the dragon is 1.0, with escalating values in between. The material parameter controls what the surface properties of the SSS Physical material should be. For example, if you put a DGS Material (3dsMax) shader in this slot, you’ll get a diffuse-glossy-specular control that you can use to make a ceramic-looking effect. The image below uses our rainbow map. This image has the rainbow map in the material map slot. Transmission controls the color that light takes as it passes through the material. For example a character’s skin might have a reddish color for the transmission swatch, while a green wax candle would have a green color. Remember that a white or grey color in the transmission slot will take on photons of all colors, rather than photons of one specific color. This is why you’ll tend to see multi-colored splotches in the default SSS Physical material. This image has the rainbow map in the transmission color map slot. You should already be familiar with what index of refraction controls. This will change how light is “bent” or refracted as it passes through the material. A value of 1 is the equivalent to air and 1.33 is equivalent to water. This image has a gradient ramp in the index of refraction map slot. Values are 0.0 to 1.5. The absorption coefficient is a 3 part parameter that controls the absorption of light as it passes through the material. Each component represents an RGB color value, not an XYZ direction value. This image has a gradient ramp in the absorption coefficient map slot. Values are 0.0 to 1.0. Similar to the absorption coefficient, the scatter coefficient is also a 3 part parameter except this one controls the scattering of light as it passes through the material. Again, each component represents an RGB color value, not an XYZ direction value. This image has a gradient ramp in the scatter coefficient map slot. Values are 0.0 to 1.0. The scale conversion factor operates the same way as it does for the SSS Fast Material. Check out it’s effects below. 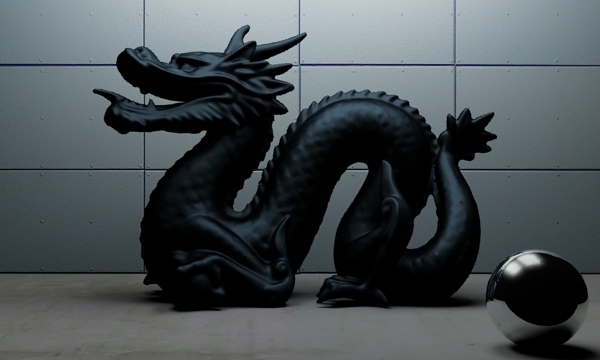 Notice that values too close to 0.0 cause errors- black areas where mental ray refuses to render the material. This image has a gradient ramp in the scale conversion factor slot. Values are 0.0 to 3.0. The scattering anisotropy parameter controls how light travels once it enters the object. The range of this parameter is between -1 and 1. A value of zero means it travels the same in all directions. A value above zero favors “forward scattering” where light prefers to continue going the way it’s is already going, while a value below zero favors “back scattering” where light prefers to bounce back the way it came. This image has a gradient ramp in the scatter anistropy slot. Values are 0.0 to 1.0. The depth parameter controls how deeply light should penetrate the object. As you can see in the image below, low values will force light to stay very shallow in the object making it glow and sparkle. Values that are too high will cause light to get pretty buried in the object and dull the effect. Finding a happy medium is key! This image has a gradient ramp in the scatter depth slot. Values are 0.0 to 1.0. The max samples parameter controls how many samples to take during the rendering process. You can increase this value in order to get smoother results but you’ll rarely have to go above 512. I like to set this at 256 until I’m ready for a final render. This image has a the maximum samples value set to 256. The max photons parameter controls how many photons should be sampled within the max radius during rendering. I.E. if you have max photons set to 1,000 and max radius set to 5cm, then during render each sample will look around up to 5cm for photons and collect up to 1,000 photons. Values up to about 1,000 should be fine. I like to set this to 512 until I’m ready for a final render. This image has a the maximum photons value set to 512. The maximum radius controls how far each lookup should go in searching for photons during render. A low value means very little smoothing will happen to the solution so you’ll need high photons and samples. A higher value will smooth out the effect allowing for faster renders, but if set too high it could look unrealistic or dull. This image has a gradient ramp in the max radius slot. Values are 0.0 to 1.0. This is pretty straightforward. It’s a list of include/exclude lights to help you refine the effect. You can add lights to this list and control how they’re considered using the “mode” parameter. Mode is an enumeration with only 3 settings so I’m not sure why it’s a spinner. See the table below for what each mode means. 0: The material considers all lights. This is the default. 1: The material uses the lights you specified inclusively. I.E. mental ray will only use the lights you provided and nothing else. 2: The material uses the lights you specified exclusively. I.E. mental ray will use all lights except the ones you provided. Now that we’ve gotten familiar with the SSS Physical material, we can look at one of the most over-looked SSS techniques- the Parti-Volume shader. What’s tricky about the Parti-Volume shader is that it follows a different paradigm to the SSS Fast Material and SSS Physical Material. Instead of considering light traveling through a medium it calculates light as though it were traveling through some murky volume like dusty air or muddy water. This technique was originally presented by Jeff Patton in the CGTalk forums and it’s a pleasure to formalize his method in this tutorial. The Parti-Volume Shader tends to be used for things like smoke or dust in the air, or cloudy water like in the ocean. In our case, we’re going to use it for cloudy glass materials like muddy water, jade, or smoked glass. The caveat to this technique is that it is painfully slow to render and is more of a theoretical exercise than anything else. You will be forcing your computer to render a really difficult material. This is the price that you pay for the impressive realism of the technique. The diagram below shows you a basic mental ray material that’s been set up with “glassy” shaders in order to create a basic Parti-Volume material. All of the changes made in this section of the tutorial are with the Volume Shader (Parti Volume (physics)). Part-volume as SSS solution setup. By setting the Extinction parameter in the Parti-Volume and Parti-Volume Photon shader to 0.35, (and all other parameters set to defaults) we get the image below. This is the original parti-volume render. You’re probably wondering what’s going on here. That’s not sub-surface scattering in the way we’ve been discussing it so far. With caustics disabled, this isn’t a photon-based solution and it’s not Fast SSS either. Instead it is a shader that allows light to pass through it in the form of ray-tracing and falloff, making it a different kind of sub-surface illumination. You’ll notice that it has that same “jelly-like” look that a strong SSS Physical material might provide. Thus, in a way, this tool should be kept in the same toolbox as your sub-surface scattering abilities. Take a look at the image below where you can really see the light scattering and diffusion in effect. With the lights brought lower to a simpler model, you can really see the diffusion. 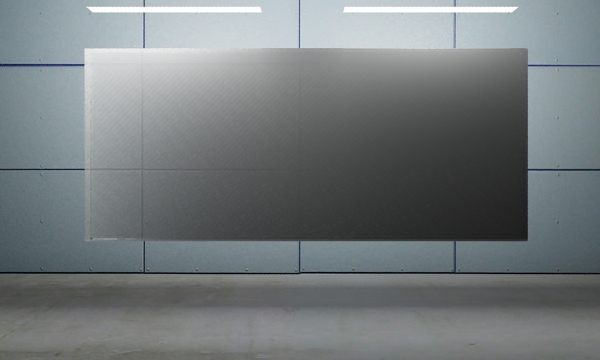 If we wanted to get really fancy, we could even apply blurry transparency to this material through the surface shader. This image was taken with a gradient ramp in the extinction slot. Values are 0.0 to 1.0. This mode parameter determines whether or not the height parameter is used. If Mode is set to 0 then the material is the same throughout the entire volume. If the mode is set to 1, then there is only cloudiness at the specified height or lower. 0: Do not use the height parameter. 1: Use the height parameter. The scatter color proved difficult to pin down since using the rainbow map in this slot caused the entire material to result in errors. It turns out that procedural maps do alright, so I used a marble map below. The documentation says that this map determines the color of the direct and indirect light that gets scattered. Apparently this is a multiplier of the photon energy for the photons in the photon volume map. This image has a marble map in the scatter color slot. It wouldn't take a bitmap for some reason. This controls how much light is absorbed or scattered in the material. A value of 0.0 means means totally clear air or material. In this case, it would be clear glass. The higher you set this value, the denser the material will become (and the more scattering you’ll see). Note that a high extinction value won’t allow photons to enter deep into the object since they will have already been scattered. This image uses a gradient ramp to control the Extinction value. Values are 0.0 to 1.0. These three parameters control the scattering process. If g1 and g2 are set to “0″ then you’ll get what’s known as isotropic scattering or diffuse scattering. That’s where light is diffused in every direction as it passes through the material. The reason there are three parameters is because mental ray uses a two-part model. Think of g1 and g2 as scatter anisotropy from before. They control whether light bounces mostly forward (high values of g) or mostly backward (values of g between 0.0 and -1.0). r is a weighting factor that lets mental ray decide the importance of g1 vs g2. g1 is multiplied by r while g2 is multiplied by (1 – r). will yield the anisotropic values of 0.25 and -0.125. This image uses a static r value (1) and g1 values are -1.0 to 1.0. This parameter spans between 0 and 1 . Lower values mean a uniformly-distributed material (like haze or mist) while higher values introduce noise into the material like cloudy quartz. This image has a gradient ramp controling the non-uniform slot. Values are 0.0 to 1.0. The height parameter is used in conjunction with the mode parameter. When mode is set to 1, the height parameter determines at what point the “fogginess” of the material should stop. I.E. a value of 1cm means that above 1cm the material should be clear. This image has the height controlled by a gradient ramp. Values are 3.0 to 15.0. Minimum and maximum step length control the quality of the effect. This is very similar to how ordinary 3dsMax volumetric effects work. A longer step length will decrease the quality of the effect and speed up your render. A shorter step length will increase the quality of the effect while increasing render times, too. Think of these in the same way as min/max samples in mental ray. Below is a side-by-side comparison of a low quality render, the original render, and one with substantially higher quality (and a very long render time). This image has three significant differences in quality, the far right is the highest. This is the full high-quality render. Light distance has to do with area lights and what level of sampling is used. While there’s not much documentation on this subject, it has to do with how far lights are from the material in order to increase the area light sampling during render. Is ignored and does nothing. When enabled, this will turn off rendering of GI information in the material. Only direct illumination would be used in that case and it could speed up your renders if you don’t need GI in the material. The light list you’re already familiar with by now. It acts as an include-only list and, when deactivated, all lights are considered.